The Duo Mobile application makes it easy to authenticate — just tap “Approve” on the login request sent to your phone. You can also quickly generate login passcodes, even without an internet connection or cell service. 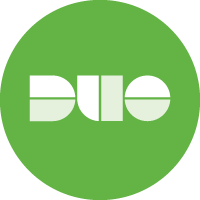 Supported Platforms: This version of Duo Mobile supports Windows Phone 7. 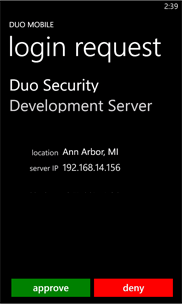 Windows Phone 8 and above should install the new Duo Mobile for Windows Phone app. Duo Push is the easiest and quickest way of authenticating. You'll get a login request sent to your phone — just press Approve to authenticate. If you get a login request that you weren't expecting, press Deny to reject the request. You’ll be given the ability to report it as fraudulent, or you can tap It was a mistake to deny the request without reporting it. 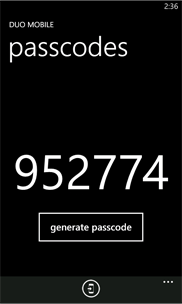 Just tap Generate Passcode to get a one-time passcode for login. This works anywhere, even in places where you don't have an internet connection or can't get cell service. Duo Mobile has to be activated to link it to your account. During the setup process you'll see a barcode to scan. Open Duo Mobile, tap "scan barcode", and then use the phone's camera to scan the barcode. This will add your account to Duo Mobile. If you get an activation code in a text message from your administrator, tap and hold the text message to copy it to your clipboard. Then go to Duo Mobile, tap "Tap here", and then tap the paste button. Then tap "activate" to finish activation. If you get a new phone and need to re-activate Duo Mobile, contact your administrator and have him or her send you a new activation link. 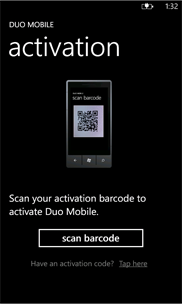 Note: Duo Mobile for Windows Phone 7 can currently only be activated for one account at a time.